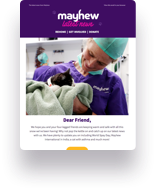 Mayhew collects and neuters owned cats or dogs within our designated catchment area. What is Pick & Snip? Our Pick & Snip programme was created to provide support to vulnerable pet owners and give them improved access to preventative veterinary care. This service is available for dogs and cats. Our Animal Welfare Officers collect the animals from the owners, take them to Mayhew’s Community Veterinary Clinic for treatment and then return them safe and sound. They also explain the benefits of neutering from a medical and behavioural perspective, what procedures will be carried out, what aftercare is required once their pet is returned to them and how to keep them happy and healthy in the future. Why have we created Pick & Snip? Pick & Snip is one of our community programmes designed to help keep owners and their pets together. By preventing potential health and welfare issues, we can stop these animals having to be given up into the shelter environment. With ever increasing numbers of cats and kittens coming into rehoming centres we have decided to focus on cats, however we do accept dogs as well (please call us to find out if you are eligible). To find out more about our Pick & Snip scheme please contact our Animal Welfare Officers by email via awo@mayhewanimalhome.org or call them on 020 8962 8000. Please consider a donation so that we can continue to help animals in the community. Our Vet Clinic offers a wide variety of low-cost services.